(06-06-2015, 10:14 PM)refraction Wrote: Setting EE to interpreter drastically improves speed. No seriously, I don't wanna clutter this thread. But THAT is weird. It's even more evidence that it is an EE timing issue. I had the guy make a test with EE overclock build and setting the slider to max OC also improved the speed a bit. So yeah, timing problem. He said EE timing fix did not help either. But yes, interpreter runs at 30fps (real) and the Recompiler runs at about 5fps, go figure! Playable in the Menu screens and anything that involves overlays. The moment it goes into a 3D environment, large maps becomes unplayable. Small maps, in this case, Ramp Mode, can be almost playable. 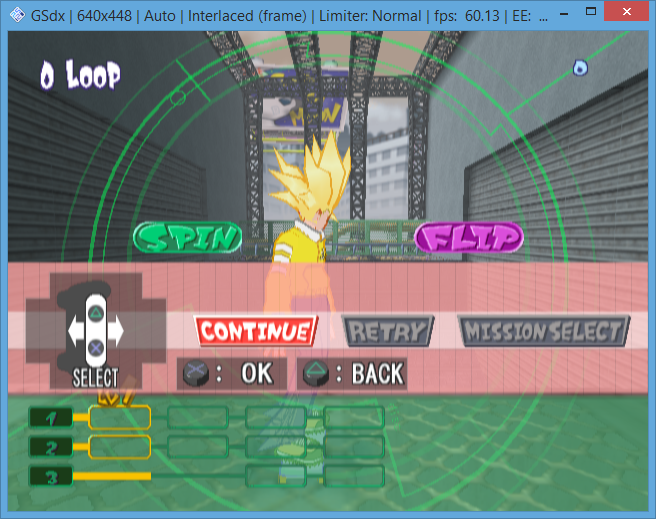 Rama, a PCSX2 Coder, mentioned that this game has timing issues and that there's an emulation bug. There are no audio issues. Audio plays normally. Cannot determine actual FPS in-game, FPS counter (Hovers around 59.97~62) counts differently than actual in-game FPS (Approx. 4~10FPS). There are two game modes that differs in terms of play-ability. 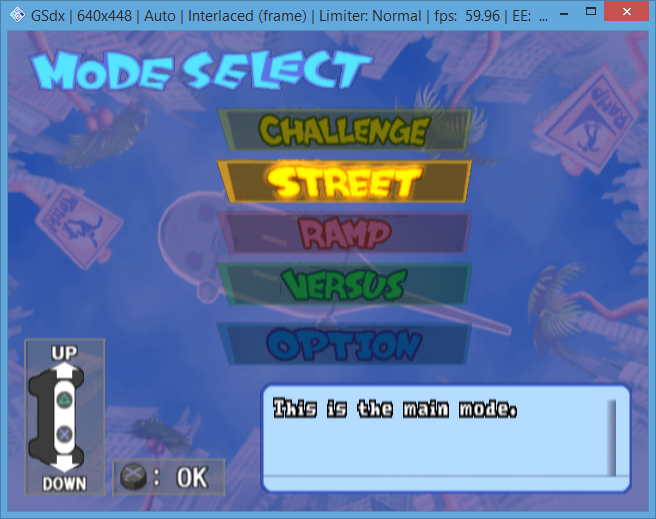 In Street Mode, the main mode of the game, it is unplayable. But in Ramp Mode, a challenge game mode, it is playable. Street Mode is unplayable due to the size of the map, and is playable in Ramp Mode due to how small the map areas are. Therefore, there are two statuses. In Street Mode, the initial loading of the map area takes a long while (1 to 2 minutes long). In Ramp Mode, loading is quick. Timing issues when playing on large maps. Timing issues scales according to map size. (Large maps = super slow, small maps = moderately slow). Different game modes and control scheme. Note the control scheme is very different. Street Mode (GIF). Take note at the top of the GIF at the FPS counter. This is the map's intro. There's nothing I can do about it to stop the intro. Input barely registers. The EE Timing hack gives the same results. I don't see much differences between the two. In the EE overclock build, if the EE settings is set to -4, the game plays a tiny bit faster than the original build. The intro in the Street Mode is now somewhat viewable, and it's 15% ~ 22% faster than the original build. Upgraded my laptop with customized dual GPU configuration. - Now Perfect in the Menu screens and anything that involves overlays. - Now playable when in a 3D environment (Tutorials section). - Large maps still becomes unplayable, but it is a bit faster. - No differences with Small Maps. Tested the Ramp Mode; can be almost playable. - No audio issues. Audio plays normally, as expected. - Still cannot determine actual FPS in-game. FPS counter (Hovers around 59.97~62) counts differently than actual in-game FPS (this time, Approx. 12~30FPS, depending on camera point of view). - Introduction demo gameplay is running okay-ish. It's "viewable". - In Street Mode, the initial loading of the map area takes a shorter, acceptable time to load (10 to 20 seconds long). - In Ramp Mode, loading is quick. Most likely same bugs. No need to repeat. Menus for Street Mode: Playable. Definitely need a beefier CPU/GPU. Cannot emphasize this more than this. I have learned the hard way around this.